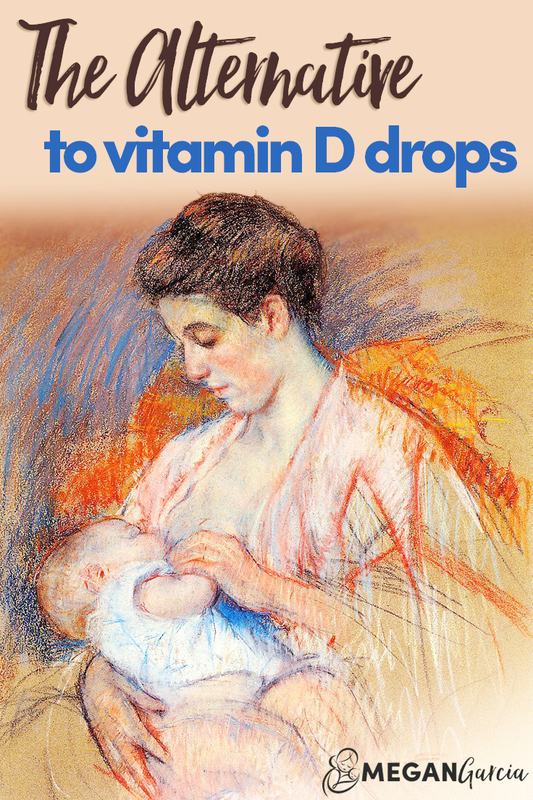 For decades, the American Academy of Pediatrics and the Institute of Medicine have suggested the breastfed babies receive vitamin D drops – beginning within days after birth and spanning the entire time you breastfeed. The problem is that many parents don’t see the need give their healthy, breastfed baby any kind of supplements. So, compliance is low and vitamin D deficiency prevails. By some reports, roughly ½ of babies and toddlers aren’t getting enough vitamin D. And of that group, 32% show signs of bone demineralization. We have shown in various vitamin D studies that mothers are more likely to take their own vitamin D supplement than to give their infants a supplement. One of the major reasons why vitamin D deficiency is so common in babies and toddlers is because mamas aren’t getting enough vitamin D while pregnant and while breastfeeding. This has to do with less time spent outdoors, less sun exposure, and a shift away from unprocessed foods that are naturally high in vitamin D.
In my free eBook First Foods That Nourish, I talk about a study that shows how a breastfed baby can get enough vitamin D. In short, researchers found that when mama takes 6400 IU of vitamin D each day, her exclusively breastfed baby has the same levels of vitamin D if she had given her baby daily vitamin D drops. Vitamin D matters because it supports the development of your baby’s immune system, with low levels possibly playing a role in the development of allergies, asthma, eczema, and autoimmune disease. Vitamin D also protects against intestinal infection. And of couse, there’s bone health. During lactation, a woman needs about 20% extra vitamin D intake, as about that much is excreted daily into her breast milk. For everyone who scrolled to the bottom of this post, the message is this: Pregnant mamas, take at least 4,000 IU per day – here are seven good reasons why. And while breastfeeding, aim for at least 6,000 IU every day. If you prefer to use drops instead, make sure it also contains vitamin K2. Like this one from Seeking Health. Are you going to use this alternative to vitamin D drop? Let me know in the comments! Great article! Is that the only brand you recommend? I would check the ingredients. For example, if you do a quick search on Amazon a brand called Zarbees pops up. The packaging is really cute but in the ingredients, it says agave nectar, which a baby (especially a newborn) doesn’t need. Thank you SO much Megan for those links! My ped rec’d Carlson’s Vit D and was curious what your thoughts were. Thanks! Hi Megan, which brand do you recommend for nursing mamas? I’ve been taking extra virgin cod liver oil but after reading Dr Mercolas update on CLO (vit A vs D imbalance), I recently stopped taking it. I’m hesitant on vit D supplements because so many are synthetic so I’d like to hear any suggestions you may have for us. Btw I’m tandem breastfeeding a 2 yo and 11 mo, is the dosage different for me? Cod liver oil doesn’t offer enough daily vitamin D and prenatals also tend to be low so I like to supplement when breastfeeding. I would look for a vitamin D3 supplement that also contains vitamin K2, like Seeking Health https://amzn.to/2BQry3Z or Thorne Research >> vitamin K2 helps vitamin D do its job and supplementation transfers to breast milk.